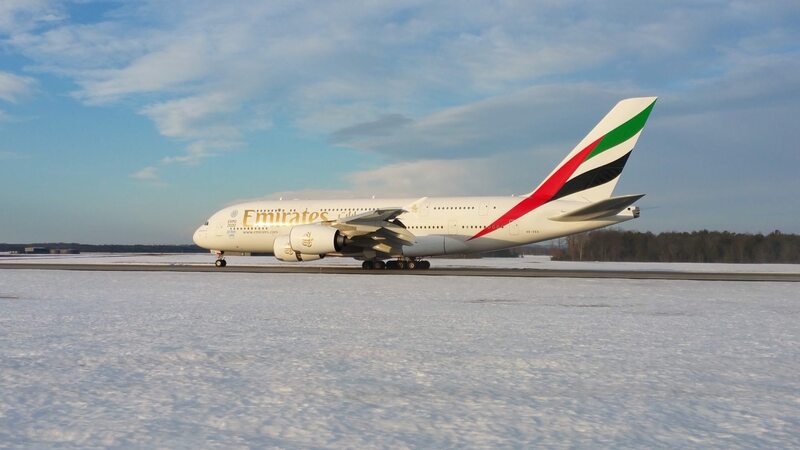 Emirates A380 Touches Down in Washington, D.C.
Emirates today upgraded its Dubai (DXB) – Washington D.C. (IAD) service with the introduction of its flagship Airbus A380 on the route. Passengers onboard the flight today represented travelers from 20 countries across the Middle East, Africa, South Asia, Far East, and North America. The Emirates A380 aircraft left Dubai at 2:20 A.M. local time and arrived at 8:15 A.M. EST at Washington Dulles International Airport (IAD) today. Replacing the existing Boeing 777-300ER used on this route, the A380 will serve the strong customer demand and bring the total number of global destinations served by the Emirates A380 to 37. The aircraft upgauge will also offer consumers traveling on the Washington, D.C. route the unique experience of Emirates’ flagship A380 aircraft, and a seamless Emirates A380 experience to many connecting destinations on the airline’s global network. Timings for the daily inbound/outbound flights on the Dubai (DXB) – Washington, D.C (IAD) route will remain unchanged. Flight EK231 departs Dubai at 2:20 A.M. daily arriving in Washington, D.C at 8:15 A.M. Timings for the return flight, EK232 will also remain unchanged, departing Washington, D.C. at 10:15 A.M., arriving in Dubai at 8:00 A.M. the next day. All passengers on Emirates flights enjoy over 2,200 free channels of films, TV shows, music, games and podcasts through ice Digital Widescreen, the airline’s multi-award winning in-flight entertainment system, free inflight Wi-Fi throughout all A380s, regionally inspired gourmet cuisine and Emirates’ renowned inflight service from the airline’s multi-national cabin crew comprised of over 135 nationalities. What’s more, First and Business Class passengers can travel to and from the airport via Emirates complimentary Chauffeur-drive service as well as enjoy Emirates exclusive lounge access in Dubai and at several locations around the world. Once on board the A380, passengers in premium class seating can relax in Emirates’ flat-bed seats and enjoy Emirates’ onboard lounge. First Class passengers can unwind in their very own Private Suite and prepare for their arrival in the Emirates A380 Shower Spa. Founded in 1985, Emirates is a global connector of people, places and economies. Based in Dubai, the airline’s global network serves 150 destinations in 80 countries across six continents. Its luxurious amenities, regionally inspired gourmet cuisine, award-winning in-flight entertainment system – ice – and unmatched hospitality provided by its iconic multilingual Cabin Crew have made Emirates one of the world’s most recognized airline brands. Emirates has carried more than 11 million passengers on U.S. flights since launching services to New York in 2004. The airline currently serves 10 U.S. gateways – Orlando (MCO), Chicago (ORD), Boston (BOS), San Francisco (SFO), Los Angeles (LAX), Seattle (SEA), Dallas (DFW), Houston (IAH), Washington (IAD) and New York (JFK), as well as operating a trans-Atlantic route between JFK and Milan and a freighter service to Atlanta. Emirates SkyCargo transports up to 650 tons of U.S. exports each week – including auto parts from New York, apples and cherries from Seattle, and oil and gas equipment from Houston – stimulating trade and opening new markets for American businesses across the Middle East, Africa and Asia. For more information on Emirates, including how to book and a complete list of terms and conditions, contact your travel agent or visit: www.emirates.com.